Feng Shui is a system for arranging your surroundings in harmony and balance with the natural world around you. In Chinese, the words Feng Shui mean "wind and water." Feng Shui For Real Life is a contemporary, practical approach that allows you to use what you already have and what you want to acquire to bring good things into your life. In our complex world, more people are turning to practical uses of Feng Shui to help them through chaotic times. Chi is energy. It is the constantly moving and changing life force that we feel around us making us feel either good or bad in a certain location. Chi can accumulate in the objects around you. In your home or office, the chi will flow in through the door and out through the windows. The goal of Feng Shui improvements (or "cures") is to keep the chi flowing gently throughout your environment rather than running straight through it. Chi can have a negative effect on your surroundings when it gets stuck or blocked. The Five Elements is the collective name used to describe the colors, shapes, and textures around you. The Elements are: Fire, Earth, Metal, Water, and Wood. Each Element is distinguished by a characteristic shape, colors, and set of attributes. 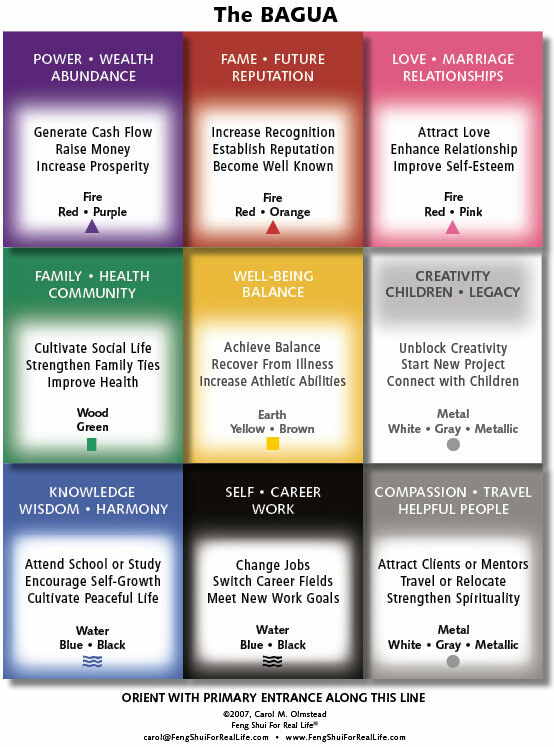 Feng Shui improvements for homes and offices balance all of these Elements in your interior environment. Vertical (townhouse, row house) - Click here for printable PDF version. Horizontal (colonial, ranch, split level) - Click here for printable PDF version. According to the yin-yang theory, everything in the universe consists of two opposing, but interconnected, forces: yin, which is feminine, and yang, which is masculine. Yin qualities are female, soft, passive, nurturing, dark, while the yang qualities are male, hard, active, aggressive, bright. This Power Principle relates to balancing the opposites around you to achieve harmony, like soft and hard, cold and hot, dark and light, floral and geometric, straight and curvy. This principle relates to the belief that the more your interior surroundings feel connected to the natural world outside, the more balanced you'll feel inside. Because every action has a reaction, we are influenced by everything around us and, in turn, we influence everything. In Feng Shui, we believe "you are what you see." That is, the colors, shapes, and images you use to decorate your surroundings will influence what you attract into your life.